Other plans we have in mind for DOOM in the months and years ahead. We're really going to do any of this--Not! Yes, there are other games out there, and we'll be involved with them. But we haven't been a team of people doing DOOM for over two years because we were waiting for someone to make another game. 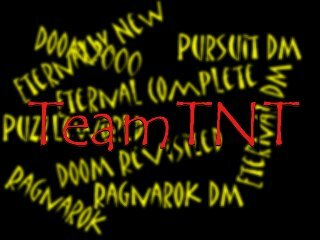 We want you to think of TeamTNT when you think of DOOM from now on. This is our Total Conversion (TC) and it's still coming along. We can't tell you too much yet, because we have to keep you from getting all excited about it and hyping it up and insisting that we release it early and then being disappointed because we WON'T DO THAT! So there. You've seen the term Total Conversion before, and usually it means that there are new levels and graphics, and maybe some new monsters and weapons. But you haven't seen a TOTAL conversion before--it's an all new IWAD file, and you'll barely be able to see any resemblance to DOOM. Certainly you won't see it in the all-new textures, all-new monsters, all-new weapons, all-new music, all-new ...well, everything but the EXE. And that won't be particularly recognizable when we get done. Expect this one some time in '98. There's an initial Ragnarok Information Page you can browse, and read the storyline. No pictures yet, so don't ask. Aha! Another 32-level set of levels using the Eternal DOOM resources (graphics, mostly) and again concentrating on solo play, but this time with cooperative play in mind too. Just in case you have friends. You may have seen some of these in their original state, but they've been refreshed with visual and play changes and they'll be well worth the download. They're all by TeamTNT/Team Eternal folks. Deathmatchers like Eternal DOOM too, but there just aren't enough levels in the original solo-designed set that play well in DM. Well, we know how to make DM levels (remember the 96 levels in Bloodlands, Grievance and Pursuit?) so there isn't any reason not to make a set of 'em with at least some of the Eternal resources too. Remember how you felt when you first played DOOM? Remember how hard it seemed to get that first green armor upstairs without those Sergeants behind the pillars taking you out? Remember seeing those fireballs fly across the zig-zag walkway and wonder what the heck that was throwing them? Remember how completely impossible it was to kill the Barons at the end of the first episode? If you don't, you missed a really great experience. If you do, you'll enjoy DOOM Revisited, 32 levels done in the original mood of DOOM/DOOM2. Sure you're better at it now, and you know the monsters, but these levels will take you back again. Wondered what that was, didn't you? Well, it's only about as long from now as TeamTNT has been a team until the end of the century, so it's only fitting that we'd be planning something that is a complete blast to greet the year 2K. This one will be released at 12:01AM of January 1st, 2000. Who else could you count on to still be around doing DOOM?